A month ago I posted some of the tears I found posted on the illicit RMT site Player Auctions from customers banned by CCP for buying ISK, PLEX, and skill point injectors. But those were just scattered bans in the months of March and April. This month, the tears I captured are different. In May, we have a legitimate ban wave. The biggest indicator is the concentrated number of bans. Over the course of 11 days, I found 13 players banned purchasing ISK and skill injectors from 4 different sellers. The bans above are the minimum, as ISK sellers will often bribe upset customers with free ISK in order to either reverse a bad review or not post the negative review in the first place. Also, a lot of buyers don't post reviews, so some dissatisfaction never reaches the public. Finally, PA, while a large site, only makes up a fraction of the grey/black market in EVE Online virtual goods and currency. If the ban wave is truly massive, I only captured a fraction of those caught by CCP's security team. The other indicator of a wider ban wave is the rising price of ISK and skill injectors. If an enforcement action takes place targeting both customers and the in-game infrastructure of ISK and skill point farmers, prices begin to rise about 2 weeks after the bans begin. 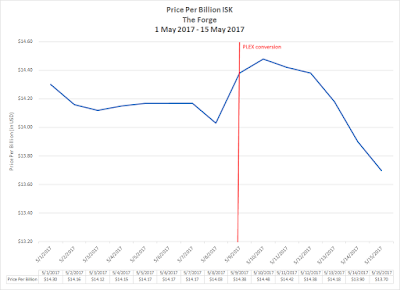 Sellers offering the cheapest ISK began raising their prices 10%-20% starting late last week. 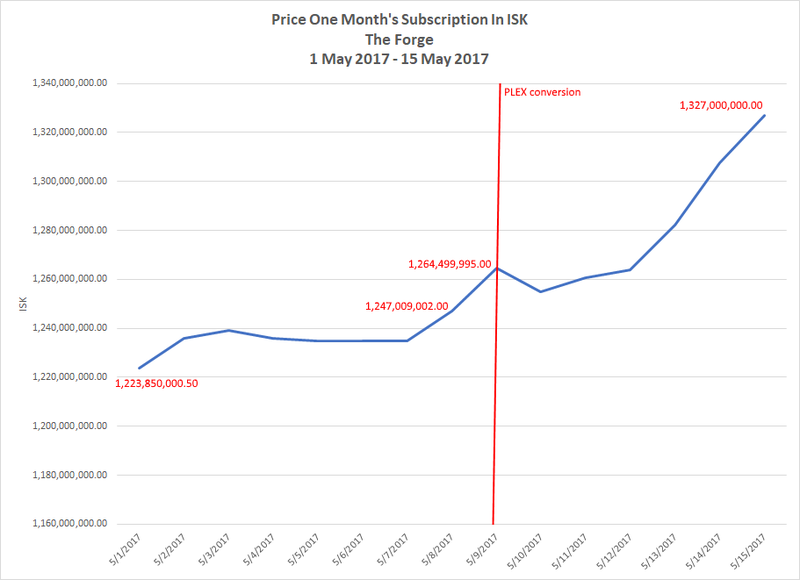 Theoretically, the price rise possibly was the result of a lowering of the ISK price of PLEX during the same time. 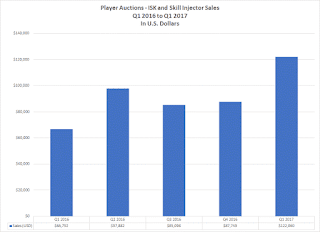 But over the past 2-3 days, the cheapest sellers of skill injectors began raising their prices 10%-20%. Lots of player bans and rising prices. I don't know if the bans are over or if CCP is still rolling up the networks of the illicit ISK and SP sellers. I would like to see a security dev blog come out one of these days just to see what is really happening. I have spent a lot of time over the last couple of weeks playing Guild Wars 2. As in, I reached level 36 last night on a brand new sylvari necromancer. I needed to dock up and run around a world in an avatar instead of a ship. I think the problem is too much of the business side of EVE is reaching into the game a little faster than I like. 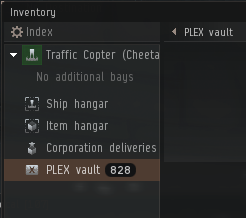 The first thing that got to me was the PLEX vault. I know, I know, just ignore the thing. But those numbers are so annoying. The solution is simple, really. I need to extract my pilots from their current locations, fly to high sec and stash the damned things in a station. Out of sight, out of mind. The next irritant was the introduction of the small skill injectors. On the face of the feature, I should have no problems. I personally never use skill injectors. I have a quirk that just sees paying money to advance in a game as bad. I don't buy experience point potions in other games. When playing Star Wars: The Old Republic, I took my dislike of XP boosters so far that I didn't even use the ones the game gave out as mission rewards. I do eat food in Guild Wars 2, but if I want an added bonus by eating food, I'm stuck with also receiving a 10% XP buff. At least the buff is only for experience gained by killing mobs. I even understand the reasoning for the the move. By making skill injectors that hold 100,000 skill points, new characters have an easier time of earning money to boost their skill point gains. Also, lower priced skill injectors are enticing to new players thinking of buying power in the game. A new player may not consider an extra $20 purchase to by 500 PLEX a wise investment. But throwing $5 or $10 at a new game? I know I have done so for a promising game if I need extra bank slots. 23. You may not exploit any bug in EVE Online to gain an unfair advantage over other players. 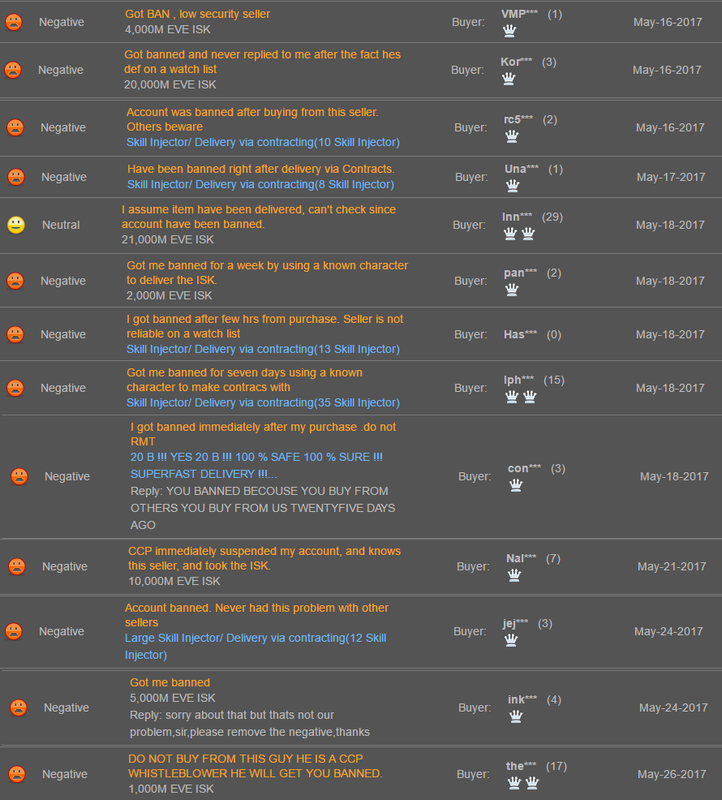 You may not communicate the existence of any exploitable bug to others directly or through a public forum. Bugs should be reported through the bug reporting tool on our website. I won't go into any more details because while the users on Reddit can go wild breaking the EULA and ToS, CCP knows my accounts and I still want to play EVE. I'll just say I don't think CCP should have introduced the small skill injectors until the exploit was closed. Once I get the disbelief out of my system I'll log in for a nice long mining session. But CCP ... FIX. YOUR. GAME. The past week was another reminder for why I don't play the markets in EVE Online. Instead, I sat on my hands and made 440 million ISK. I thought when the conversion from aurum to the new PLEX occurred, the ISK price would go down. Why? Because I thought everyone would race out to cash in their new found wealth. The increased supply would drive down the price. If I sold immediately, I could watch the price drop and then pick the PLEX up at a lower price while making a small profit. Between the 2 PLEX I already owned plus the free aurum sitting on my accounts, I have over 2700 PLEX. Instead, I did nothing. 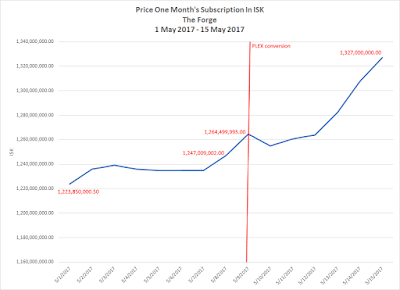 And the price rose from 1,247 million ISK per one month of game time on 8 May to 1,347 million yesterday. I'll conclude with the possible effect on the price of illicit RMT. Despite the price increase for two month's game time from $17.495 per month to $18.177 per month that occurred on 9 May, the price of game time still fell 4.2% (60 cents) over the course of the first half of the month. Market forces may eventually relent, but at $13.70/billion ISK in The Forge, some ISK sellers will soon see sales fall unless they lower prices. With the launch of the 119.5 today, EVE Online receives the fourth opening cinematic video in the games 14 year history. Given that I had a little bit of trouble finding all of them, I thought I'd make a post including all four, just so I can find them again. Just a couple of notes. First, CCP seems to flip between wanting to feature the background story and focusing on the new player. The first and third cinematics introduce players to the lore while the second and fourth focus on the potential of the player. Next, CCP did need to make a new opening since the old one included references to DUST 514. Finally, despite the technical excellence, the new opening video is my least favorite of the four. Really, how can any video compete with Angry CONCORD Guy in the cinematic that CCP just replaced? One of the truisms of MMORPGs is if a game introduces a free-to-play element, gold sellers will come to try to make a profit. EVE Online is no exception. The illicit RMT markets exploded as ISK sellers tried to keep up with the increased demand that began with the launch of the Ascension expansion on 15 November 2016. Once again I will use information collected from Player Auctions, a site that hosts virtual currency sellers for many games. I record the transactions on the site as best as I can and even post tears when CCP catches the buyers. While not making up the majority of sales on the secondary RMT market, the site is still substantial enough to give some idea of the trends among the ISK sellers. 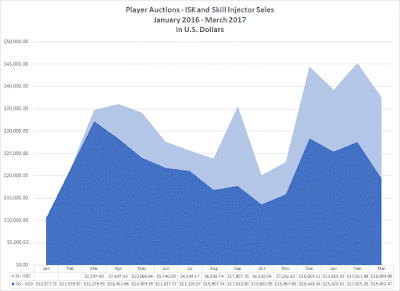 In the first three months of 2017, sales boomed on the illicit markets for ISK and skill injectors. The U.S. dollar value of sales increased almost 83% from Q1 2016 to Q1 2017. The below graph breaks down the sales by month instead of by quarter. Notice the contribution of skill injectors to the gross sales numbers on the secondary market? I don't believe the love of skill injectors is just confined to the buyers on PA. Players who roam from one F2P experience to the next are noted for wanting to level up quickly, which is why most cash shops offer experience point boosts. In EVE, the only experience boost available is the skill injector. The above chart shows the steady growth of skill injector sales while the sale of ISK is relatively seasonal. Even with the introduction of the alpha clone F2P system, ISK sales on PA rose less than 10% in Q1 2017 compared to Q1 2016. The big difference was skill injector sales. 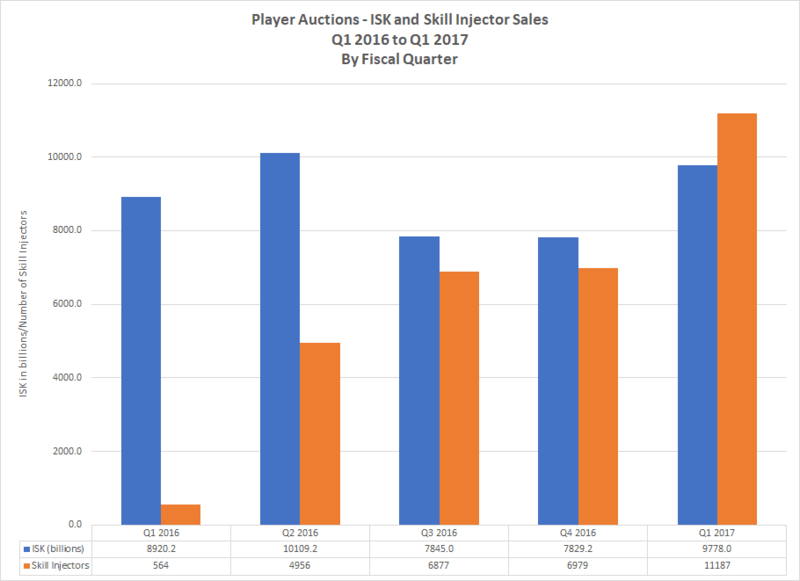 In the first three months of 2017, the number of skill injectors sold exceeded the number of billions of ISK sold. While ISK still brings in more money, I think skill injectors have supplanted PLEX as the second biggest thing sold. One of the reasons for making the post now instead of earlier is that everything in this post may become outdated. One week from today the changes to PLEX and the cash shop go live. I am eager to see the effect of the new PLEX on the market. I also want to see if the change will also bring about more people getting caught buying the item on the black market. People tend to want to purchase the new shiny and I suspect PLEX are a little easier to track than other virtual objects and currency.